Remove handle securing pin using correct diameter punch, wind off handle. 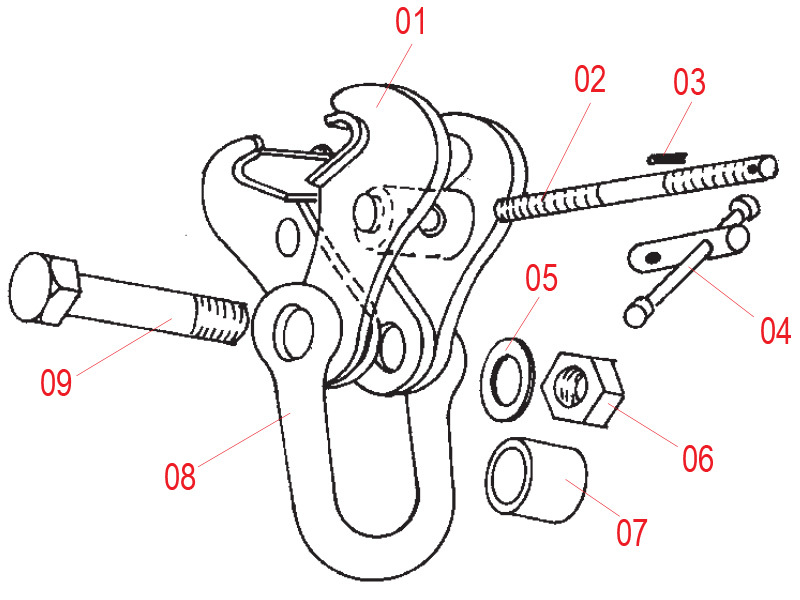 Remove shackle pin, wind off left and right hand side frames, (where adjusting screw is damaged it may be necessary to cut away damaged area to allow screw to be removed). Check for wear in other parts of clamp. Install new adjusting screw winding left and right hand side frames equally to centre land area of screw. Replace shackle and shackle bolt, fit new shackle bolt locking nut. Wind on handle and secure with new spring pin. It is advisable that all parts be well lubricated before being put into place. Remove knuckle and adjusting screw assembly, wind off old knuckles from adjusting screw. Wind on new knuckles left and right hand, ensuring both are equally to centre land area of screw. Re-fit onto clamp side frames using securing pins provided. Wind on handle and secure with new spring pin, lubricate with grease. Remove locking nut on front of chainwheel. The chainwheel is held in position by a woodruff key. Draw chainwheel and chainwheel centre from drive shaft. Remove woodruff key from drive shaft. Remove drive shaft from wheel plate. Ensure drive shaft bush is not damaged. Re-assemble gearing as above in reverse order. Remove wheel and wheel axle from wheelplates. Press out axle from bearing. Remove internal circlip from back of wheel and press out old bearing. Ensure all components are cleaned thoroughly and press in new bearing. Press wheel axle into bearing (ensuring wheel spins freely on axle). Fit completed assembly back onto wheelplate. Remove handle securing pin using correct diameter punch, wind off handle and locking collar. 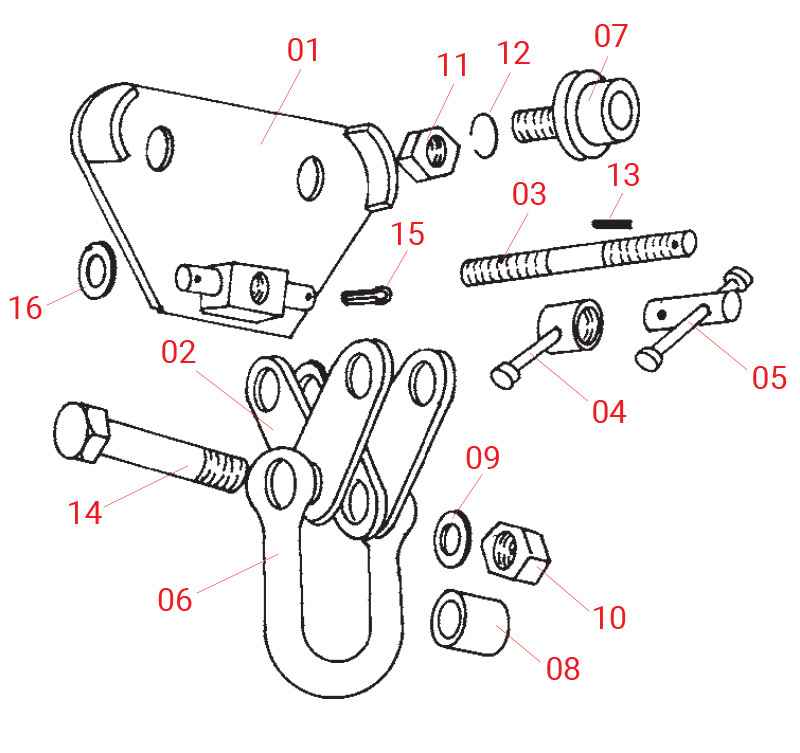 Remove shackle pin, wind off left and right hand wheelplates, (it may be necessary to cut away damaged area of adjusting screw to allow screw to be removed). Fit new adjusting screw winding left and right hand wheelplates equally to centre land area of screw. Replace shackle and shackle pin. Renew shackle pin self locking nut. Wind on locking collar and handle. Secure handle with new spring pin.